In 1942 C. L. Browning, a general contractor in San Antonio, purchased the 977-acre Hill Country property subsequently known as the Browning Ranch. During the first twenty years of the Browning familys weekend and summertime life on the property, the raising of cattle and sheep was overseen by ranch foreman Anton Naumann. Nell Naumann, his wife, tended a vegetable garden and a peach orchard, and the four Naumann daughters helped with such chores as feeding hogs, milking cows, and collecting eggs. Although Mr. Browning built the gravel roads that are used today by trucks and other motor vehicles, in those days horses were the principal means of transportation around the ranch. The barn, with its hay loft, tack room, and feed and milking stalls, was an active place and a popular attraction for children. 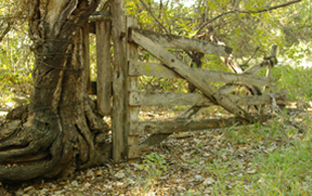 Cypress-wood gate hangs at the base of an old Texas walnut tree (Juglans microcarpa). Over time the character of the Browning Ranch began to change. With the ever-increasing popularity of deer hunting, recreational ranching came to dominate most of the Hill Country. The Browning and Naumann children grew up, and the Naumann parents no longer occupied the stone house near the main gate. After Mr. Brownings death in 1972, his wife and grown children continued to go to the ranch on occasional weekends and holidays, but their visits became increasingly less frequent. Some cattle were still raised, but the labor-intensive, old-time Hill Country life of self-sufficiency waned, and the smokehouse, chicken coops, hog pens, garden, and orchard fell into disuse. With the exception of an occasional crop of oats for cattle feed, cultivation ceased, and the fields lay fallow. Meadows for grazing began to shrink in size as the vigorous juniper trees (Juniperus ashei) encircled stands of live oaks and spread along the creek bed and its tributary washes. They even grew over and around the stone walls built by early settlers, making them virtually invisible. Invasive brush gradually obscured the once-striking views of the Pedernales River and impaired the hydrology of the ranch, reducing the amount of water available from the numerous springs and seeps from the limestone aquifer. A combination of overgrazing and chronic drought further reduced the remnants of the native savannah grasslands, and erosion gullies became a common sight throughout the ranch. In 1992, upon the death of her mother, Betsy Rogers inherited the Browning Ranch. Between 1992 and 2001, she operated the ranch house as a bed-and-breakfast accommodation and leased grazing rights on the ranchs pastures to a cattle owner. In 2001, inspired by the work that had been done to reclaim the nearby Bamberger Ranch Preserve as a model of sound land stewardship and environmental preservation practices, Ted and Betsy Rogers decided to develop a similar mission-focused use for their ranch. To pursue their mission, in 2002 they hired Scott Gardner, an environmental scientist, as ranch manager and coordinator of all collaborative projects undertaken on the ranch.